Don Horner, a descendant of George Horner [1726 MD-1793/1794 Orange County, NC] tested 37 markers. George was the father of Revolutionary War soldier George R. Horner [1761 Orange County, NC-1844 Moore County, NC]. 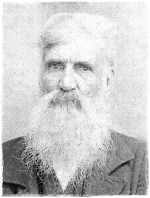 George R. Horner was the progenitor of the Moore County, NC Horners. Don further descends from George R. > George Washington Horner > James Washington Horner > Josiah Turner Horner [Don?s grandfather]. To date, Don has matched an additional Horner. Jack Delbert Horner [deceased] descends from George Horner [1726-1794] as well but through son William Horner [1746-1824]. William's family migrated to TN and his descendants continued on to MO and later throughout the western United States. [S115] Larry Kraus' Horner Genealogy [http://www.larkcom.us/ancestry/history/horner.cfm].